Continuing on down my path of learning the pipe making art has brought me to another question. This one is concerning mounts. As of right now I understand the subject this way and I'm looking for correction and any further information. Army and Military mounts are one in the same. Pipes that are actually Army/Military mounts have a metal sleeve in the shank running the length of the mortise. There is briar both inside and outside of this sleeve and the only way to see it is from the rear of the shank. They may also have external ferrules for decoration. Mounted pipes have a ferrule of some type. It can be of wood, horn, bone, antler, metal, wood, plastic and so on. This is installed on the outside of the shank and briar is still in contact with the tenon. This can serve to strengthen the joint, but is not a true Military/Army mount. Spigots are mounted pipes having an external metal ferrule, but also have a metal tenon on the stem which extends beyond the joint when fully inserted into the pipe. The question I still have, assuming I've got the right idea thus far, is whether the Army/Military or Spigot pipes also require a tapered mortise and tenon joint. Are there any other categories that should be in this group? Army and Military mounts are one in the same. The military mount is analogous to a cork in a bottle neck. The inside neck of the bottle has a uniform diameter. It's the cork that is tapered. It's the same with a military mount pipe. The shank mortise is the bottle-neck and the mortise is not tapered. The stem tenon is tapered like the cork. So the tapered stem tenon is functionally a splitter. It would crack the shank over time. So they all have a functional band or ferrule on the exterior of shank that prevents that. Spigots are usually sleeves in sterling that cover the tapered stem tenon. It's always an ebonite/spigot metal to briar fit when the stem is seated. It is very likely that this first occurred as a field repair to a pipe using a spent rifle cartridge. And the spigot was really the tapered end of the spent cartridge that covered the broken stem end with the shank band or ferrule either a ring or a larger section of the cartridge. 1) Pipes that are actually Army/Military mounts have a metal sleeve in the shank running the length of the mortise. There is briar both inside and outside of this sleeve and the only way to see it is from the rear of the shank. 2) They may also have external ferrules for decoration. 3) Mounted pipes have a ferrule of some type. It can be of wood, horn, bone, antler, metal, wood, plastic and so on. This is installed on the outside of the shank and briar is still in contact with the tenon. This can serve to strengthen the joint, but is not a true Military/Army mount. Unless there is a cork in the bottle it's not a military mount. 4) Spigots are mounted pipes having an external metal ferrule, but also have a metal tenon on the stem which extends beyond the joint when fully inserted into the pipe. 5) The question I still have, assuming I've got the right idea thus far, is whether the Army/Military or Spigot pipes also require a tapered mortise and tenon joint. Only the tenon is tapered. The mortise is a uniform diameter cylinder like the bottle neck. Both are larger than their 'cousins' in a normal mortise-tenon joint. 6) Are there any other categories that should be in this group? I like how the gravity drain-trap on the Peterson keeps any nicotine from reaching the mouth. You tell the FDA that and see if they buy it. What joegoat describes is based on information from tool makers like J Alan and SpoonBits.com. Both sell tool kits to produce pipes with what they call 'Military Mounts'. Both the mortise and the tenon are tapered 1.5 degrees. My experience as a tool and die maker shows that anything less than 2.5 degrees can be a 'locking' taper. If the angles are precise and the finishes on both parts are good enough, the two parts can lock together (think morse tapers). I suppose the metal ring serves the same function as an external ferrule and that is to resist the splitting force of the tapered stem. I've seen a few makers lately who are making pipes with the metal tube inlaid in the end of the shank for no reason other than aesthetics. 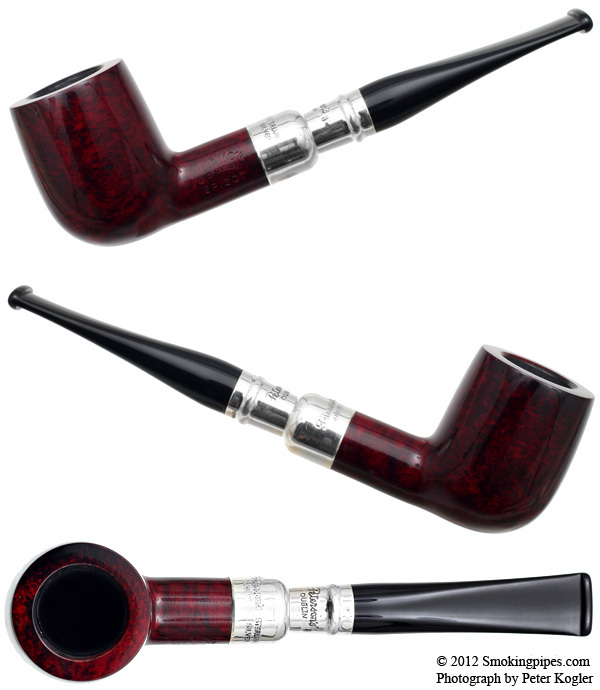 Besides saying I like these types of pipe muchly, I have nothing else. Oh, wait! No. That doesn't matter. Nevermind. So what are the pros and cons of this method over a traditional military mount and/or a standard mortise and tenon? I recognized the feasibility of this method in Joe's description but it is not a traditional military mount. 1) Is it compatible with a spigot? 2) Would the now decorative ferrule leave any advantage to doing this ie why bother if a decorative ferrule is present (it just adds cost)? 3) If neither a spigot nor a ferrule is present then why not adopt the standard mortise and tenon mount? 4) If the pipe design isn't compatible with an external band/ferrule and it needs a military mount (why?) then this is a solution. But I'd have to see the pipe design. This definitely adds cost. 5) A functional improvement that is more than aesthetics might make a better case. I would like to hear about any functional improvement other than the ferrule eliminated. How is it better functionally? Short of seeing pipe designs that make this necessary it looks like a neat technical flourish without a real necessity. It's nice to see the innovation though. And if there are nice pipe designs that require this then I'd love to see them. Specifically, If this is how you get to an American shape then it's interesting anyway. OTOH adding cost that ends up increasing the price shrinks the addressable market. I like my traditional military mount pipes esp. when they have sterling mounts. Bling. I've never made a pipe like this or used a pipe like this, and I've not discussed it with anyone who has, so this is all speculation. Short of adding silversmithing to his bag of tricks, the maker would have to buy ferrules and then build the pipe to fit. That's perhaps a restriction he would rather not face. A traditional ferrule has a huge affect on styling. To my eye a ferrule is the focal point of any pipe that has one. Lastly, ferrules are old school. Whether this new method is better or worse may not be the point. The fact is that it's newer. And new is always better than old, right? If I know anything about you, it's that you feel our societies are marching up and to the right. We're getting better as the knowledge of each new generation is built on new discoveries. Out with the old, in with the new. Think back to your youth and remember Kirsten or 'The PIPE". That's ok. I appreciate your posts and posting the vid. It's always interesting to see the new innovation. Your speculation and comments are appreciated. I think some of the pipe makers can do silver work. Larry Roush comes to mind and then there is certainly Les Wood, Maurizio Tombari and probably others. I remember John Calich making a wide sterling band for one of his pipes and he only did it once. I own that pipe. He told me that if he did it again he'd go to a silversmith. He did use bands made by others. I've always liked the look of a spigot. I'm a clencher, though, and I've always been afraid that clenching a spigot pipe would lead to a disaster. Do they need to be held while smoked? Was it you that said you had a Peterson that fell apart while you were camping because you had to use your hands to do some chores? I'm on the search for a military mount in honor of my late father who spent 27 years in the army. Since he didn't smoke I thought this might be a good way to honor him. 4) You're hunched over so that the pipe is hanging exactly vertically out of your mouth. 5) You no longer believe in God, because he looks after fools and their pipes. When you're as old and grey as me, with old worn pipes, and you're a hunchback, with a half bent military mount then you need to be cautious when all the conditions are met. It's rare. Until then let your impetuous youth drive it all on. Bring on those military mounts. You only live once and you have to give it all back when you die. Worry about real problems. This isn't one of them. So a military mount is composed of a tapered tenon and a tapered mortise. 2.5 degrees or less is optimal taper for this. The ferrule is not a necessity to properly call a pipe a military mount, however it is a good idea in order to prevent the wedge from splitting the wood. If a ferrule is used it may be external or inlaid. Spigots are military mounts, but they also must have a metal sleeve on the tapered tenon that mates with a tapered mortise. The mortise may be of naked briar. These pipes also have metal ferrules to pair with the metal extending up the stem from the tenon. Assuming my previous definition of a military mount is correct; spigots are nothing more than a military mount pipe with a metal sleeved tenon and a bit of that sleeve running up the stem for cosmetics. It is my understanding that military mount and Army mount are synonymous as you point out. 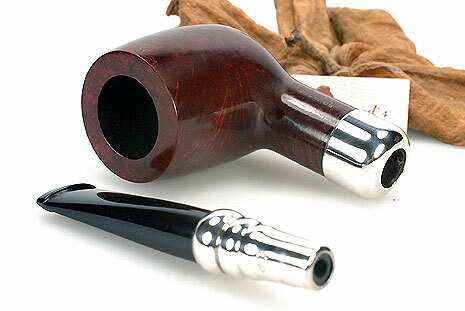 It's my understanding that this design came about so that military men could take their pipes apart quickly and stuff them in their pocket or rucksack when needed without worrying about the effects of removing a stem on a hot pipe in addition to not having to worry about broken tenons and shanks. The proper method is to taper the tenon and the mortise and reinforcing the shank with either an inset metal ring (most often brass in modern military mounts) or external ferrules or bands to prevent the shank from splitting as already pointed out. The more modern style of inset ring like the ones in the video FredS posted serves the same function as the external ferrule but is more versatile. It allows the use of military mount mortise and tenons without the design constraints of the ferrules. I'm very familiar with the method of making a pipe with military mounts but haven't made any because I don't really see much of a point. The tools needed are relatively easy to fabricate if you have a metal lathe. I just don't see that the benefits are significant enough to warrant making the tools or spending the money to buy them. I suppose, if soldiers composed a significant number of my customers I'd invest. The military mount was always intended to be a practical solution not an embellishment or fancy feature for hipsters. But that's just my opinion. I've always seen a metal band as a good idea because of the strength it adds, whether the tenon is tapered or not. 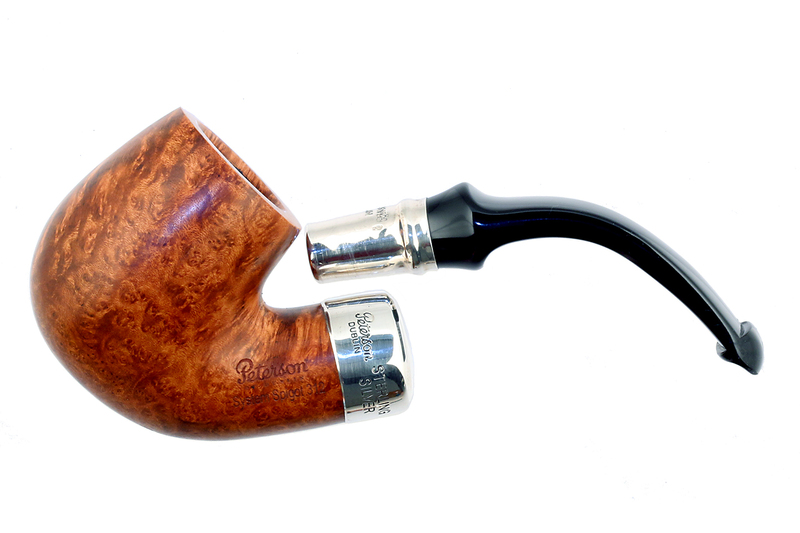 From a visual standpoint, I also tend to favor pipes with something between stummel and stem. After hearing from y'all, I'm seeing the tapered mortise and tenon as overkill. All of my pipes so far have been made with delrin tenons and I like the benefits of doing it this way. A tapered tenon would make the use of delrin difficult. I don't see any true military mount pipes in my future, but I may give the inlaid ferrules a whirl for the added durability.